A little extra practice can make a huge difference when things really heat up on the green -- have fun training right in your own backyard with this driving range set from Callaway®! 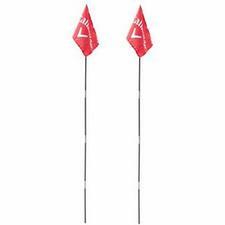 It includes two shock-corded, collapsible flag poles designed for fast, hassle-free setup outside. If you have any more questions about the Callaway Golf Backyard Driving Range (Includes 2 -6'5" Flags); do not see the model you are looking for; need custom options; or prefer to not purchase online, then please call us at (630) 656-1291.